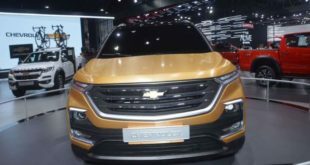 The Chevrolet manufacturer has decided to re-launch its well-known mid-size crossover SUV which will appear on the market as the 2019 Chevy Blazer. The new Blazer will receive more premium look, and a standard two-row interior equipped with many modern infotainment and safety features. Under the hood, there will be two engine options and available all-wheel drive configuration. The Honda CR-V, Toyota RAV4, and Subaru Forester will be its main rivals. 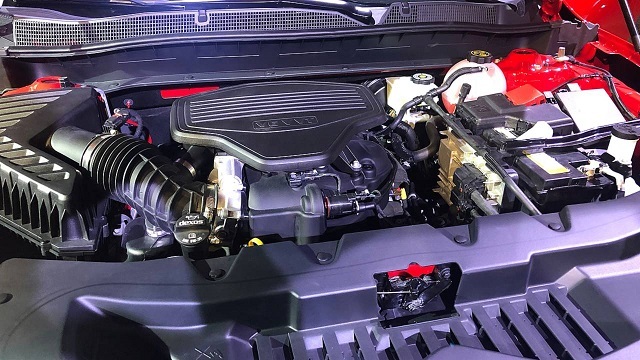 The all-new 2019 Chevy Blazer will receive two engines under its hood. The base will be a 2.5-liter inline-4 engine. This unit will be able to generate 193 horsepower and 188 pound-feet of torque. The engine will work with a 9-speed automatic transmission and will feature a stop/start and direct injection. However, the optional powertrain will be a 3.6-liter V-6. This engine will have the output of 305 horsepower and around 269 pound-feet. This unit will also work with a 9-speed automatic gearbox and will come with direct injection and stop/start. The front wheel-drive system will be standard while the all-wheel drive system will be available as an option. All the versions connected to an all-wheel drive system will have an option to disconnect the rear wheels from power in order to provide improved fuel economy. Furthermore, the RS and Premier trim levels will feature a twin-clutch all-wheel drive layout which can offer different levels of power to the rear wheels and in that way deliver improved handling and traction. As well, the new Chevy Blazer, powered by a V-6 engine, will be able to tow up to 4,500 pounds. Unfortunately, the fuel economy of both engines is not yet available and we will know more after the carmaker’s official announcement. 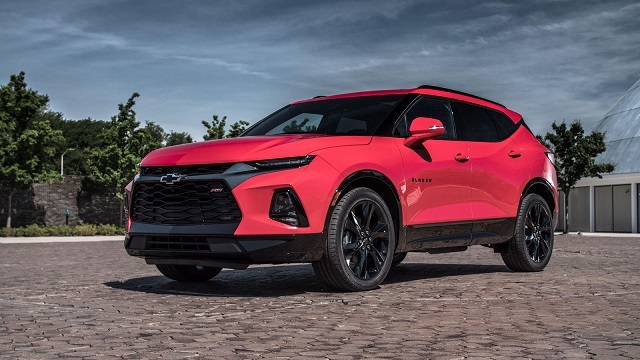 The 2019 Chevy Blazer is a mid-size crossover SUV which stands between the Equinox and the larger three-row Traverse with which it will share the same underpinnings. However, it will look more aggressive than the Traverse model. As for the external appearance, the carmaker has given it some styling cues borrowed From the Camaro model and those include wide stance, thin headlamps, tall hood, and larger grille on the front fascia. 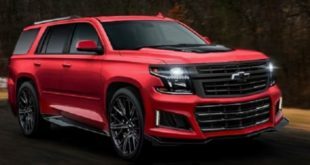 The Chevy Blazer will also feature new LED lighting, more pronounced fenders, black rear roof pillars, and generally a sportier look than its predecessor. The base model will ride on the standard 18-inch wheels while the larger 20-inch rollers will be optional. As well, the RS and range-topping Premier will come standard with 20-inch wheels and the 21 inchers will be optional. Furthermore, according to the manufacturer, each trim level will get its own, unique details. Therefore, the RS model will get more black accents which will give it more menacing and sleeker appearance. However, the Premier will feature more premium looks with nice chrome details. The all-new 2019 Chevy Blazer has two rows of seats and it is able to welcome up to five passengers. 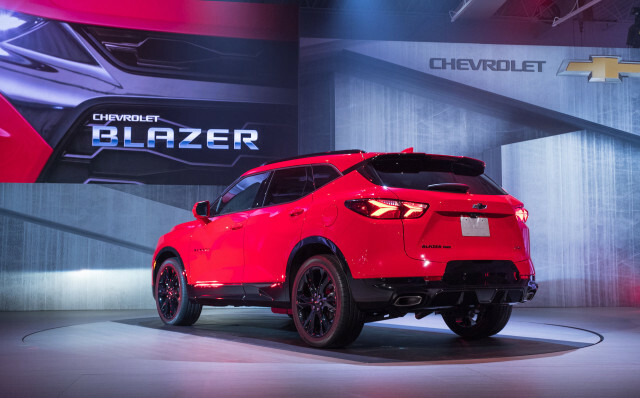 Depending on a trim level, the Chevy Blazer will feature different color combinations and accents. So, the RS model should have red accents while the Premier will most likely get a two-tone interior color combination with some nice galvanized chrome details. The rear seats can be folded down in case you need more space for the cargo. So, behind the front seats, the Blazer will offer the room of 64.2 cubic feet. 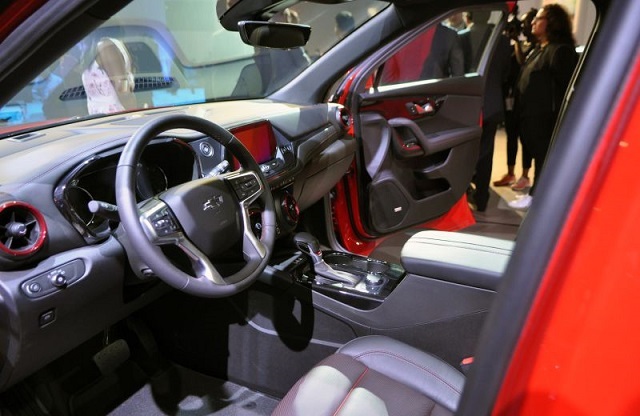 On the center of the dashboard, there will be an 8.0-inch touchscreen for infotainment system and Apple CarPlay and Android Auto connectivity. 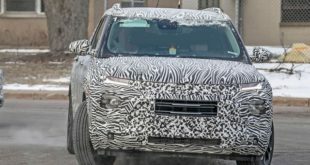 The newest 2019 Chevy Blazer will feature many standard and optional features. 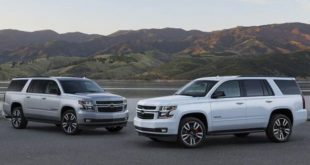 So, all the models will come standard with an 8.0-inch touchscreen for the Chevy’s latest MyLink infotainment system, Apple CarPlay and Android Auto connectivity, four USB ports, 4G LTE Wi-Fi hotspot, a sliding rear door etc. It will also be available with optional heated and cooled seats, a leather-wrapped steering wheel, automatic climate control, remote start, Bose audio system, comfort-open windows, a panoramic twin-pane power sunroof, and so on. A hands-free power tailgate, a wireless charging pad, and six USB ports will be standard on RS and Premier trim levels. The new feature which will be standard on Premier and RS models is a Cargo Management System which includes a rail system and a cargo fence which serves to protect small items by dividing cargo area. As for the safety, a forward-collision warning and full-speed automatic emergency braking will be standard. However, we can also expect a rearview camera mirror and adaptive cruise control to be available. The 2019 Chevy Blazer is set to go on sale sometime in the beginning of 2019. The carmaker still hasn’t confirmed the exact price of the upcoming Chevy SUV, but we will know more, closer to the launch date.